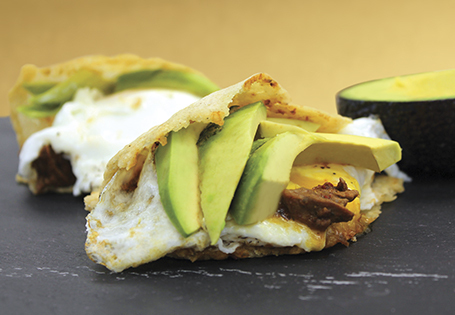 A South American classic dressed up for a tasty on-the-go breakfast or sumptuous brunch. In a blender, combine chipotles with adobo sauce, lime juice, cilantro, onions, cumin, garlic and vinegar. Blend until smooth; add additional lime juice if marinade is too spicy. In a zip top bag, combine chipotle mixture and carne picada. Refrigerate. In a large bowl, combine corn masa, salt, 2 teaspoons oil and water. Mix until a soft dough forms. Cover dough and let rest 5 minutes. Divide dough into 12 equal size balls. Using a heavy pan or tortilla press, press dough into ¼-inch thick discs; smooth edges of the disc. In a large skillet over medium heat, heat remaining 1 tablespoon vegetable oil. Cook masa discs until lightly brown, about 3-4 minutes per side. Let cool. In a medium skillet over medium-high heat, heat carne picada. Cook until meat is browned, about 4-5 minutes. Remove from stove; keep warm. Coat a large skillet with cooking spray; heat to medium-high heat. Fry eggs to desired doneness, season with salt and pepper to taste. To assemble: cut a small slit in each arepa, forming a pocket. Evenly divide meat, eggs and avocado among each arepa. TIP: Arepas are a great way to use leftovers! Make a double batch of dough, cook and freeze. Fill with leftover meat, cheese or veggies for a simple on-the-go meal any time of day.